Living up here in the mountains like I do, a chain saw is a vital tool to be kept in the vehicle at all times so that one can cut his way in or out when trees fall across the road. 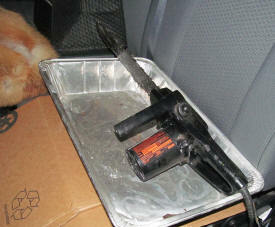 I had a tiny little McCullough gas saw but it stank up the cab of my truck and was always hard to start. Not to mention having to keep fresh fuel in the thing. So I decided to go electric. 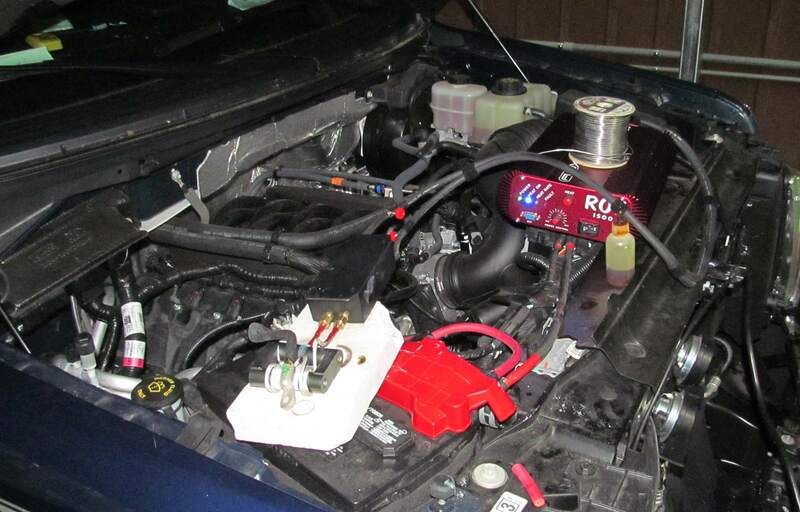 So I ordered a Harbor Freight 2000 watt inverter that I'd had good results with in the past, some #2 welding cable, a few Anderson Connectors and a few solder type terminal lugs. 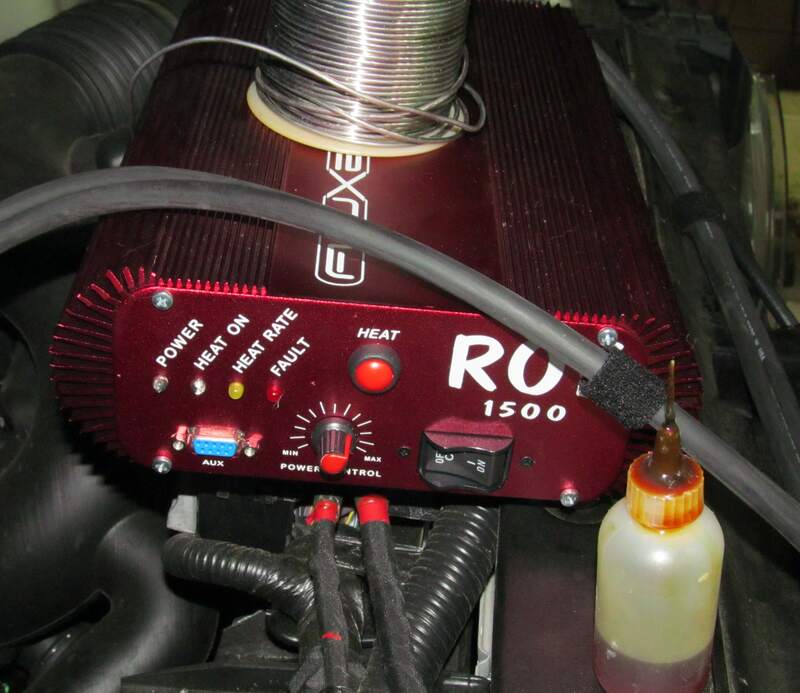 Oh, and not to forget, the use of the incomparable Fluxeon® Roy 1500 induction heater with flux concentrator. If you don't have an induction heater, a small butane torch will do in a pinch but it doesn't do nearly so neat a job. The lugs and Anderson can be had from Cloud Electric. The "175 amp" Anderson connector (you'll need 2 or 3) is part number DS-6325G5. The 2 gauge cable lug is part number BT-4802F. You'll need 2 of those. Finally, you'll need about 5 ft each of #2 welding cable in red and black. If you want to make a gonzo set of jumper cables, get about 10 more feet of each color and 2 500 amp battery clips from NAPA. 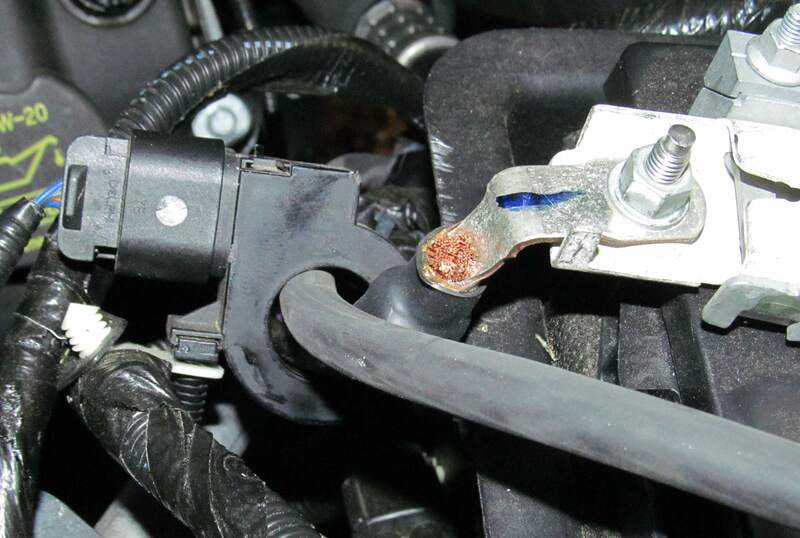 The nifty thing about Anderson Connectors is that they're hermaphroditic. That is, they'll mate to each other. No such thing as a male and a female. This makes several things very convenient. 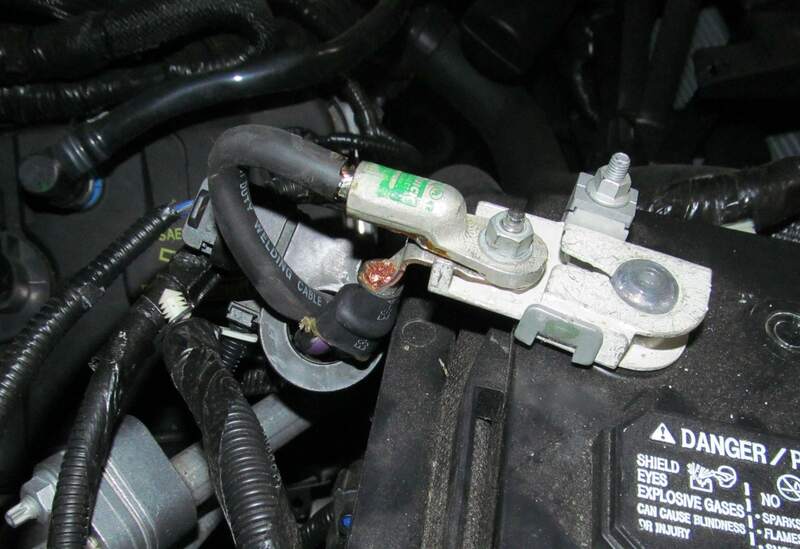 One thing that is very nice to have is a jumper cable with clips on one end and the Anderson connector on the other. That kind of jumper isn't worth stealing except for its copper so you don't have to be so careful with it. It'll plug right into the Anderson connector we're about to install. 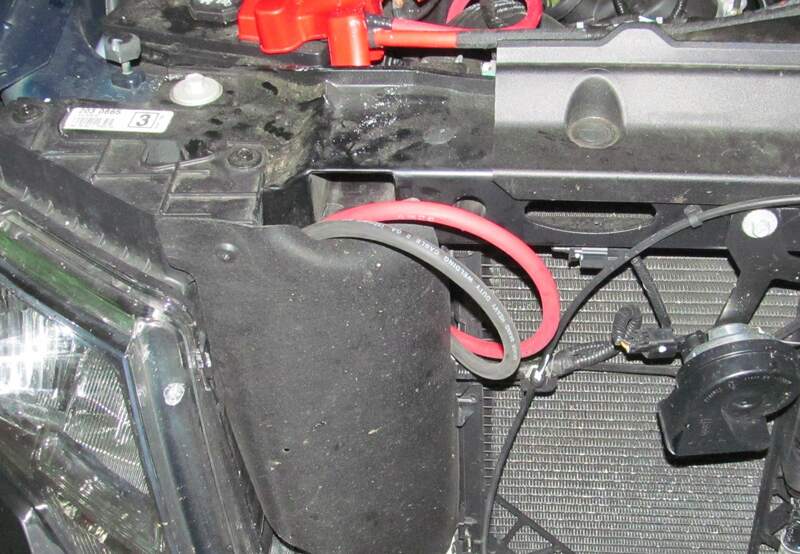 And if you want to run the inverter on some other vehicle, just plug the jumper cable Anderson connector into the one on the inverter. OK, now that we have all that settled, let's get to work. Here's what we're working toward. The cables from the battery to the grey Anderson cables are connected, the leads from the other Anderson connector are connected to the inverter and a 100 ft extension cord is plugged into the inverter. 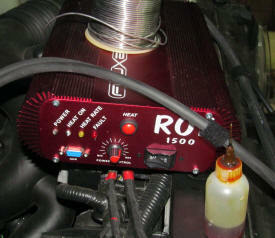 Here we are set up with the Roy induction heater getting ready to solder the negative terminal. 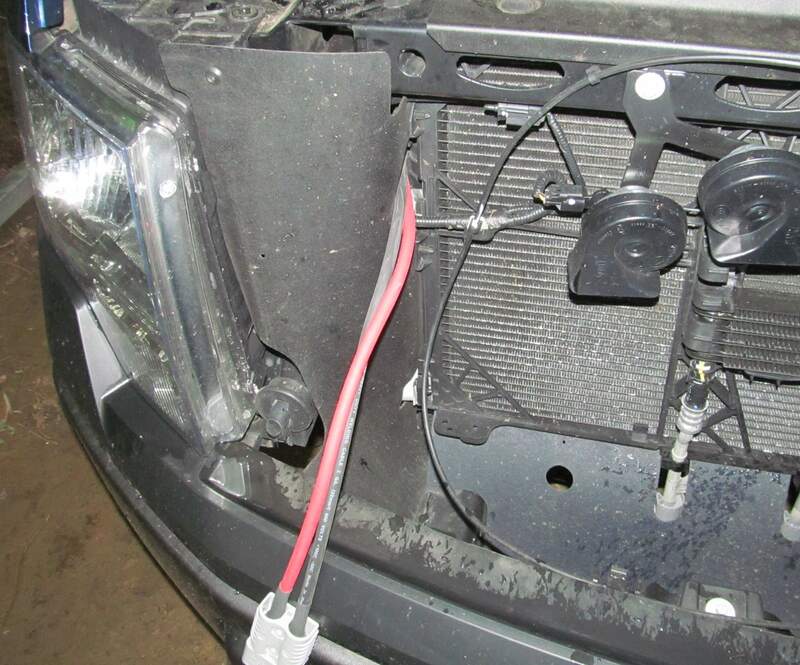 This new Ford truck has a current sensor on the negative lead that measures current into and out of the battery to keep track of its state-of-charge. This new cable must pass through that sensor. 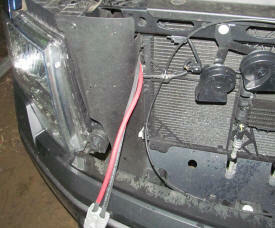 The cable will fit but the lug won't so the lug has to be soldered after the cable is threaded through the sensor. 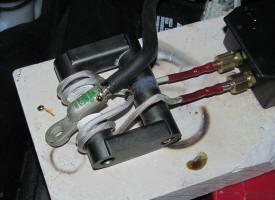 Here's a close-up of the cable lug and the Fluxeon® flux concentrator. The flux concentrator concentrates the RF field into the gap that the lug sits in. When the heater is turned on, there is no noise, no sparks and no flame. In fact, you might notice from the photo above that I'm doing the work - quite safely - on top of the battery. The white stuff is a refractory board that is heat proof. This photo shows everything needed to do a great soldering job. A roll of heavy gauge rosin core solder, some liquid rosin flux and the Roy. 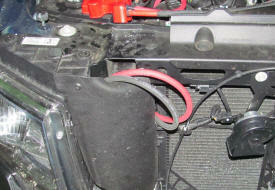 Here is a close-up of the current sensor with both the factory cable and the #2 cable passing through it. 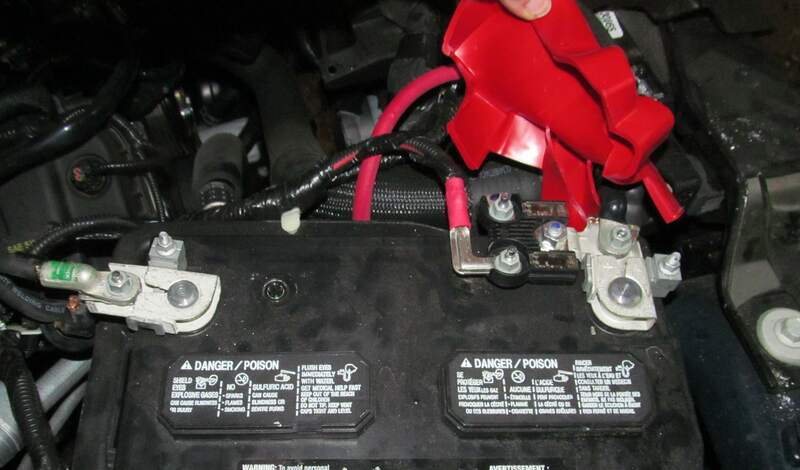 The negative cable properly attached to the battery. This shows both cables properly attached to the battery. The red cable lug is just barely visible to the right of the cluster of cables. It is taped up with black electrical tape to reduce the possibility of shorts. 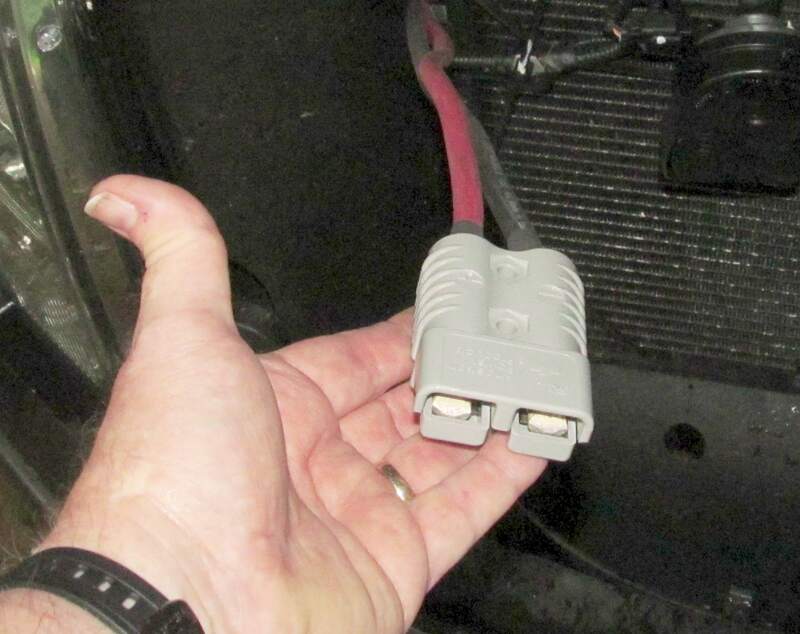 Here's the cable with the Anderson connector attached showing how it comes through the front bulkhead. The cable is protected from chaffing by some adhesive backed foam rubber wrapped around the cable. A close-up of the Anderson connector. When the connector covers arrive, the cable will be allowed to hang down so that it can be reached without opening the hood. The covers protect the connector from road grime and stuff. I forgot to order them, also available from Cloud Electric. Cable stowed away out of the weather for now. The chain saw in the back seat, ready to go to work. This saw is branded "Remington" but is made by DESA tools and is model #099178H. They make larger saws but they consume more power. This is a very nice sized saw for the purpose I got it for. It amazes people how well it cuts - at least as well as an equivalently sized gas chainsaw. The steam table tray is a handy way to transport the saw and keep grease and oil off the upholstery. As soon as I get a truck bed toolbox, the saw and inverter will go back there but for now it just sits in the back seat.